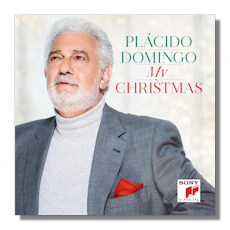 Placido Domingo (b. 1941) is in good voice still, despite his advancing age. Moreover, on this album he gets fine support from a number of talented singers as you can see in the heading, including his son Placido, Jr., Jackie Evancho and, on the instrumental side, from The Piano Guys and Banda El Recodo. Although the music here is generally light and festive, Domingo puts his heart into every selection, and it is fitting that he has dedicated the album to the memory of his younger sister who died in June, 2015. Most readers interested in purchasing such a disc are obviously not looking for deep musical analysis of the works offered, but rather an evaluation of the performances and arrangements. Regarding the latter, the songs are generally arranged to yield the most colorful aspects of the music without sounding like long-haired treatments. As for the performances… The disc starts off with Have Yourself a Merry Little Christmas (arr. Sally Herbert), wherein Vincent Niclo partners Domingo, and on track two, Guardian Angels (arr. Lee Holdridge), Idina Menzel joins the tenor. Both of these are splendid accounts, as are most of the remaining ones involving other singers, including those in Domingo's Young Artist Program who appear in God Rest Ye Merry, Gentlemen (track 5 arr. Nicholas Dodd & Nick Patrick). Perhaps the best singing though (and best music maybe) comes in Lloyd Webber's Pie Jesu (arr. Nicholas Dodd), which is of course not a Christmas song at all. Here, Domingo is joined by Jackie Evancho, who sings beautifully and actually steals the show. New Zealand Crossover singer Hayley Westenra joins Domingo in Loving Christmas With You (track 9) and imparts a fresh and innocent quality to the music with her very youthful sounding voice, which contrasts well with Domingo's darker and more mature sound. The younger Domingo gives a youthful quality as well to the Irving Berlin classic, White Christmas (arr. Lee Holdridge). Feliz Navidad (arr. Lee Holdridge), despite its spiffy performance, sounds quite out of place coming after the Mozart's Ave verum corpus. That said, most listeners will like it still, as it is a rousing way to close the disc. The sound reproduction is very good. No album notes or texts are provided, but we mostly know the words to these songs and who needs notes for this kind of recording? A very nice Christmas album.